School administrators are constantly under pressure to improve school conditions while cutting costs. One simple and effective way to do just that is to invest in mechanical insulation. Mechanical insulation encompasses all of the thermal insulation used on mechanical systems, including boilers, HVAC systems and ducts, to reduce energy use and greenhouse gas emissions. Many schools and similar facilities currently utilize mechanical insulation, but too often it is missing or damaged, and that lack of maintenance coupled with delayed repair could be causing dangerous situations for both staff and students. But the benefits of properly installed and maintained mechanical insulation in schools are undeniable. Insulation helps cut the energy bill. Although administrators often recognize the importance of mechanical insulation in schools, the pushback is usually budgetary. Effective insulation does require an upfront investment, but the ROI is surprisingly fast. Most facilities see a return on their investment in less than a year, with the rest seeing a return in less than two years. The return comes in the form of cost savings due to decreased energy use. The energy savings due to mechanical insulation in schools have been studied by the National Insulation Association. They found that mechanical insulation saves schools, on average, 13 kBtu/sf/yr of site energy (about 20 percent of the total usage). These infrared photos were taken recently at a school in Chittenden County, Vermont. Pictured here are sections of uninsulated pipe. The infrared imaging shows just how much heat and energy is radiating off of this system whenever it is in operation. If this system was insulated, this heat and energy loss would be prevented. Many schools already have at least a partial mechanical insulation system installed. 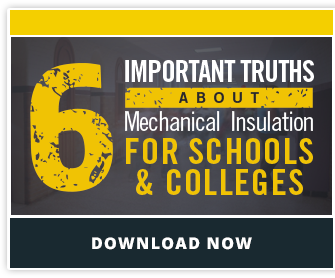 This article from Insulators Local 50 highlights the importance of not simply installing mechanical insulation in schools, but properly maintaining the system once it’s there for the sake of everyone who works and learns in the building. Here is an excerpt from the article, which describes a school superintendent’s determination not to repeat old mistakes during an upcoming school construction project. One of the benefits of insulating mechanical systems is increased personnel safety, but when the insulation system begins deteriorating, it can actually have the opposite effect and become dangerous to the health and safety of the building occupants. Even for schools with existing mechanical insulation systems, creating an insulation maintenance initiative should be a priority for reducing energy use and keeping students, staff and teachers safe. This is a simple way to improve the overall conditions of a school building while simultaneously cutting costs. By doing this, insulation can contribute toward creating the best possible learning environment.